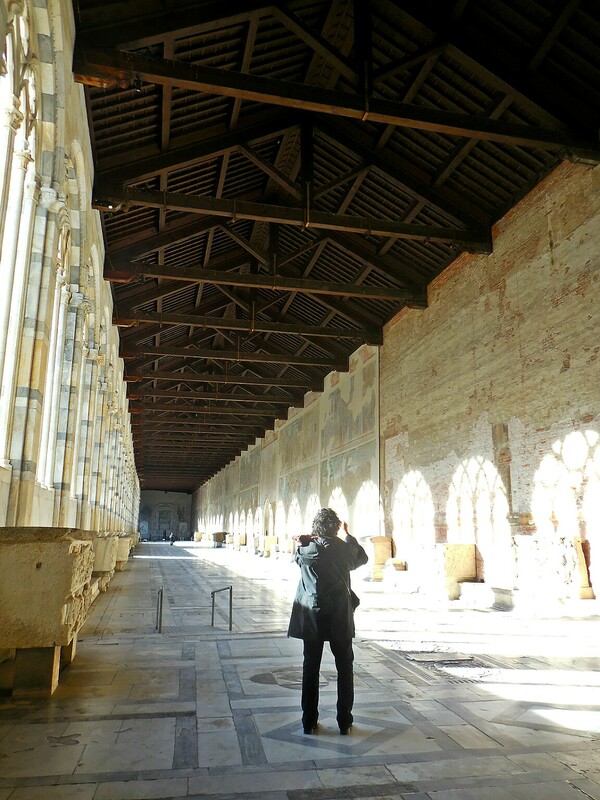 Loris and I never got around to visiting Pisa although we always mean’t to go. The train to Pisa goes from a train station that’s just five minutes from our apartment and we always thought we would do it on the spur of the moment but never did. So, when my sister was here, I talked her into going there. 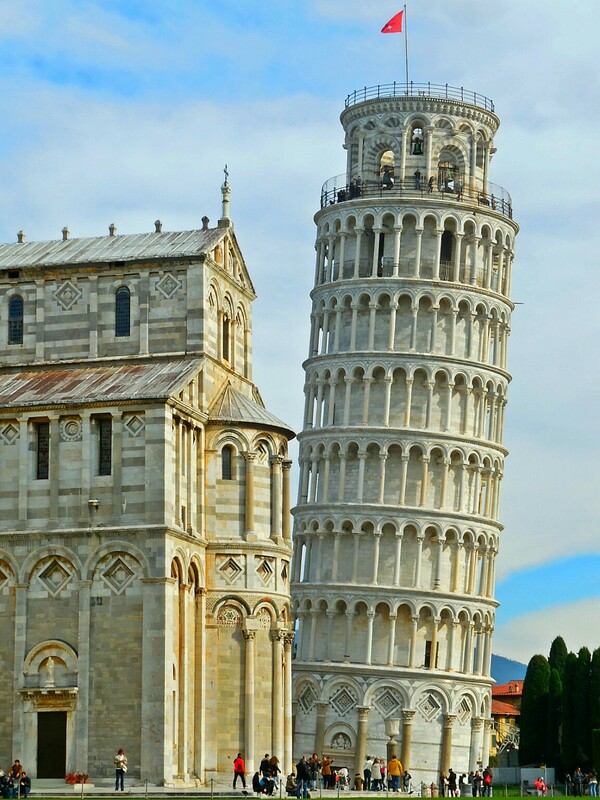 Most tourists go to Pisa just to see the Torre Pendente as it’s called and often don’t even spend the night there. 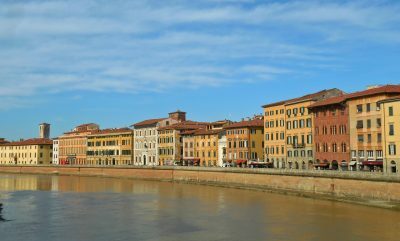 It’s a small city with the River Arno flowing through it and was an important seaport during medieval times. In 1063, the Pisans attacked and conquered the city of Palermo in Sicily returning with a lot of treasure. 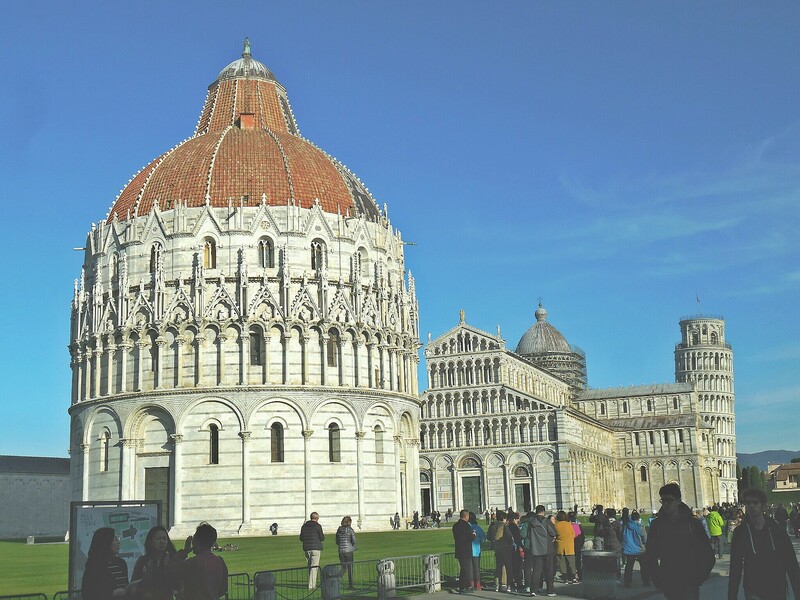 They used it to show off their importance by building a cathedral complex, the Campo dei Miracoli (Field of Miracles) which was to have a cathedral, a baptistery, a bell tower and a cemetery. 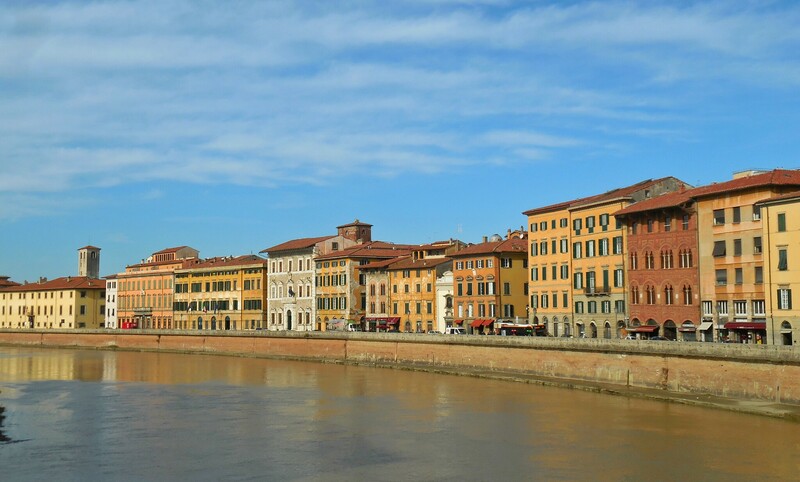 Pisa is said to have got its name in 600 BC from a Greek word meaning marshy land so you know what’s coming next! 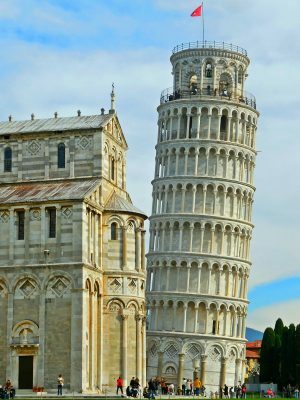 The soil in the area of the Campo dei Miracoli is soft so when the tower was started in 1173, it began to tilt when the 3rd storey was reached. In fact, the cathedral and baptistery also lean very slightly. Luckily, it was a time of wars and instability so building was stopped for about a hundred years which allowed the soil to settle and hold the weight. If it hadn’t been for this, the tower would have toppled very quickly. Building resumed in bits and pieces and wasn’t completed until 1370, almost 200 years after it was started. This too was a good thing as it allowed the soil to settle each time building stopped. At one point, in an effort to correct the lean, an architect made one side of the upper floors slightly taller on the short side which didn’t help and only made it lean more on account of the extra weight. Anyhow, by 1990, the tilt made the tower around 15 ft off the vertical and the danger of toppling was imminent. A group of experts was convened to come up with a plan to stabilize it and the tower was closed for 10 years. Around 2000, through a masterpiece of engineering and much preparation, the soil was carefully removed from under the tall side while the tower was anchored with steel cables. This worked and the tower is actually beginning to straighten. It is now open and visitors can climb to the top once again though we chose not to. We did, however, visit the rest of the complex. The Baptistery is enormous as you can see above. The idea was that only the baptized could go into church so baptism took place in the Baptistry and the newly baptized were then taken across into the cathedral. We had the good fortune to experience the wonderful acoustics as we happened to be there at noon when the guard stepped into the centre and entertained us with his fine voice. 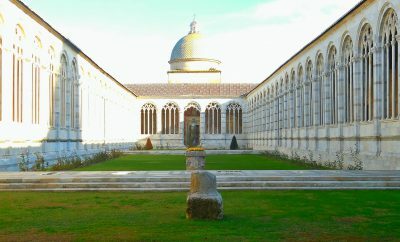 The adjacent Camposanto cemetery is particularly beautiful with sarcophagi and burial places in an arched cloister lined with frescoes. The more important frescoes have been moved to the museum though three of the finest are in a little gallery within the cloister. Unfortunately, they’re being restored so we didn’t get to see them. 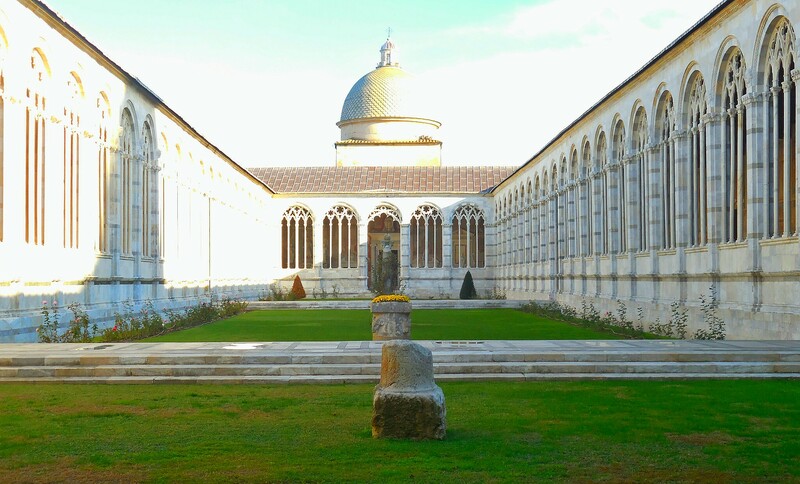 I was interested to see that the mathematician Fibonacci who was from Pisa is buried here. When I was in Fes in Morocco, I came upon a plaque saying that Fibonacci had lived and studied there and indeed it was he who introduced the Hindu/Arabic decimal numeral system to Europe as well as the concept of zero. As if that wasn’t enough, he came up with the Fibonacci sequence which is like a miracle, really interesting and beautiful to see in nature. I’m glad that he ended up in the Field of Miracles. In the centre of Pisa is the Piazza dei Cavalieri which has a number of interesting buildings including the Pallazo dell’Orologio (Clock Tower) which is now a library but housed the town jail in medieval times. We were wandering around the Piazza after lunch hoping to be able to go into this palazzo when we saw a few people standing in the foyer. We rushed over and it happened to be a special tour for a few students which they let us join. Well, it was most interesting. In 1288, Count Ugolino, the Mayor of Pisa at that time, was accused of treachery and imprisoned in the clock tower with all his male heirs. Not only imprisoned but actually walled in and left to starve. This is recounted in Dante’s Inferno and Dante alludes to Ugolino cannibalizing the children as a result of hunger. 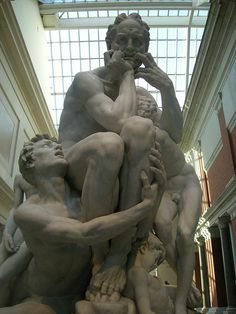 The alleged episode has been depicted by many artists including Carpeaux, Rodin, Dore and Blake. I was relieved to find out that this ghastly event likely did not take place. In 2002, an Italian paleoanthropologist, Francesco Mallegni, did DNA and chemical analysis of the excavated bones of Ugolino which revealed traces of magnesium but no zinc suggesting that he had consumed no meat in the months before his death. Poor man, to have achieved such dubious fame through Dante’s imagination. On the way to the station to get our train, we saw a huge mural by Keith Hareng painted on the wall of the Sant’Antonio church complex. 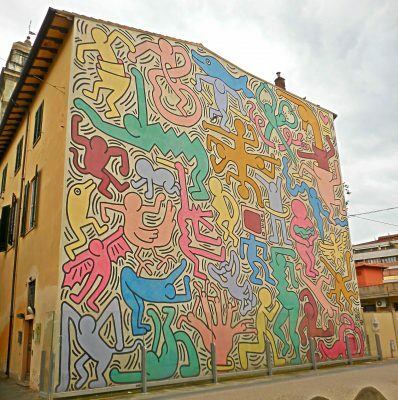 Apparently, Hareng met a student from Pisa in New York and ended up coming to Pisa in 1989 and doing this mural entitled ‘Tuttomondo’ representing world harmony. He died a few months later so it was likely his last major work. I only went to Pisa because since the train there was so convenient, I thought I should make an effort to see the leaning tower. I never thought that I would see and learn so much in the process. This entry was posted in Italy, Travel. Bookmark the permalink. lucky for us too. v interesting. did the train go along the coast? how long did it take? Yes, the train did go along the coast past Marinella and Liguria alongside the Roman road, Via Aurelia, for a good part. Lovely landscape. It took about three and a half hours and we took a packed lunch so it went quickly. Let me regale you with a little story about lunch……….the man across the aisle from us, pulled out a single sandwich from his bag and proceeded to offer to share it with the couple across from him who he hadn’t been talking to and clearly didn’t know. So when I pulled out our substantial lunch from my bag, I felt compelled to offer some to the man sitting opposite us who we hadn’t engaged in conversation either. Well, what do you know but he was a Professor of English Literature, from Lucca, working in Brazil and spoke fluent English. We chatted at length and he gave us all sorts of tips about Lucca, where to eat, where to go etc. It was most entertaining and the time flew. It made me think how a simple act of politeness (which shamefully, I didn’t think of by myself!) could give you so much in return. A very pleasant journey indeed.